Audi Q3 vs Range Rover Evoque | What Car? The Audi Q3 and Range Rover Evoque are two of the most eagerly awaited new models of 2011. Both are stylish and desirable, blending SUV looks with a sporty twist and compact dimensions. To help you get to know both cars, weve put together a list of key facts for each so you can quickly and easily compare one with the other. 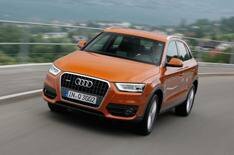 You can also read our verdict on the Audi Q3 from our first drive. Weve also had a sneak preview of the Range Rover Evoque in action and we'll publish a full first drive report on July 13. With these two big-hitters about to go into battle in UK showrooms, we've put them head-to-head right here. See how they compare.